So you’ve been hearing a lot about the Crystal Coast lately. You’ve been reading our blogs and following us on Facebook, Instagram, and Twitter. And we’ve convinced you that you want to spend your next vacation in Emerald Isle or one of the surrounding communities. But we’ve only done half of our job! Next, we want to make it as easy as possible, and affordable, for you to visit us. So in today’s blog, we’ll help by providing you tips on ways to save money so that your vacation to the Crystal Coast will feel like a splurge while you stay within in your budget. All of Emerald Isle Realty’s properties have their own unique charm that makes them great, but did you know there are more options to choose from than just oceanfront? Selecting a second row property instead of an oceanfront, can significantly save you money. We have many second row cottages that still have stunning ocean views and can fit well into your budget. Seldom Inn is a second row cottage with 4 bedrooms and 3 ½ baths in a secluded forest setting. It sits back on an oceanfront peg lot, so you don’t have to cross any streets to get to the ocean! It also features an elevator, Island Club linens, multi-level porches and decks, and breathtaking ocean views. We also have middle row and third row properties that offer easy beach access and plenty of amenities. Solace per Aqua is a hidden gem in the middle row with 3 bedrooms, 2 ½ baths, Island Club linens and 3 private decks with furniture, including an observation deck with ocean views! Or take a look at High Hopes, a 4 bedroom/4 1/2 bathroom, third row cottage offering Sand Castle linens, whirlpool and garden tubs, a rec room, elevator, fireplace and so much more. Plus, you’ll love the amazing views of the Atlantic Ocean! Another area to find some extra savings is in the type of property you choose to rent. For example, you can rent one of our duplex rentals rather than a single family cottage. With a duplex, you can still enjoy desirable amenities like a hot tub, swimming pool, or even a basketball court. Plus, duplexes are great for family reunions, giving families multiple places to hang out, sleep, and enjoy the beach life! Several duplexes even offer connecting doors so that you can easily access both sides of the property. We have a great oceanfront duplex available, Bahama Breeze East and Bahama Breeze West. Each side has 4 bedrooms and 5 ½ baths, and our unusually spacious, boasting over 2,800 square feet. Take in Emerald Isle sunsets from the covered and open decks with porch furniture on all three levels or enjoy a cool night in front of the gas fireplace watching Netflix. Or take a gander at Carolina Dune East and Carolina Dune West. It’s an oceanfront duplex with 4 bedrooms and 2 bathrooms on each side, and also has a connected door. 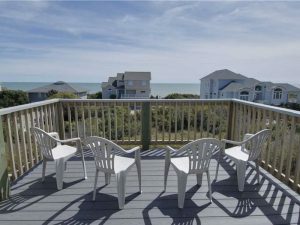 It has a custom kitchen, spacious oceanside decks, and a boardwalk to the beach with dune decks. It’s even pet friendly! 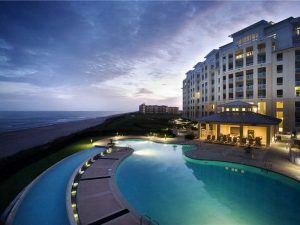 The Crystal Coast has a treasure trove of condo rentals offering the freedom of a residence and similar amenities of a hotel, such as a swimming pool or gym. And with several locations and options to choose from, you’re sure to find one that fits your needs, wants, and budget. Pier Pointe and Pier Pointe West are both 3 story buildings each with 6 condos. Choose from both oceanfront and second row residences, offering some of the most beautiful sunrises and sunsets the East Coast has to offer. The property features such amenities as a private oceanfront walkway, swimming pool, tennis court, and several grilling areas. 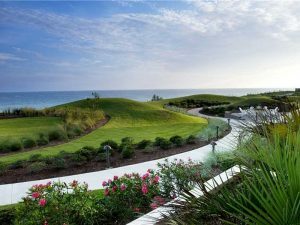 Ocean Reef condominiums in Emerald Isle is a private community featuring several 2-bedroom residences with amenities like linen service, flat screen cable TVs, wet bar, jacuzzi, and deck with porch furniture. Guests have access to The Country Club with golf, tennis, swimming, and dining. Grande Villas in Indian Beach has several oceanfront condos to suit your needs. Choose from 2-4 bedroom villas or even a top-floor penthouse. Each one feature multiple bathrooms, master suites with oceanfront terraces, linen service, custom kitchens, and flat screen TVs. Property amenities include swimming pool, nature preserve, Club Lounge, state of the art health and fitness center, sport and games lounge, fire pit, and more. The length of your stay can affect the cost of your Crystal Coast vacation. Most of our vacation rental properties are offered for week long stays. But we do have some excellent cottages, duplexes and condos that offer great nightly rates on summer vacation rentals so you can spend a few days relaxing beachside. Aloha is a second row cottage in Emerald Isle with 4 bedrooms and 3 baths. Beautifully furnished with a reverse floor plan, this rental offers great ocean views and easy beach access. You’ll definitely want to see if its availability falls in line with your schedule! Another great rental with nightly bookings available is Sunset Dream East. 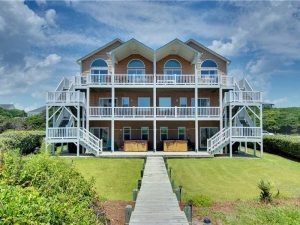 This second row duplex in Emerald Isle has 4 bedrooms and 3 bathrooms, including 2 master suites, one with a jacuzzi tub. We are a firm believer that any time is the right time to visit the Crystal Coast. And if you’re looking to save on your vacation rental, then getting away during the Spring, Fall or Winter may be the best bet for your budget. The off-season on Bogue Banks allows for secluded days by the sea, since the majority of our guests choose to visit during the summer. Without the sometimes suffocating cover of the hot summer, it creates a special time with impeccable weather for great outdoor activities. Adventurers flock to this area during this time to enjoy several styles of fishing, kayaking, shelling, biking, and even eco-tours. 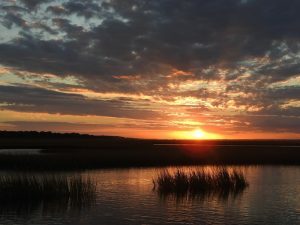 The off-season is an incredible way to experience the many undertakings of the Crystal Coast without the hustle and bustle of the summer season. Find specials on nightly rentals available during the off-season, or check out our long-term rentals in Emerald Isle that you can rent by the month. The rates may be low, but you can set your expectations high! 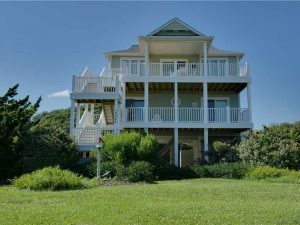 Our Vacation Rental Specials page is the place to go to find the latest and greatest deals on your Southern Outer Banks vacation. Here, you’ll gain access to our most recent promotions to save you money on your perfect vacation. If you’re a procrastinator, or one that likes to do things at the spur of the moment, then our Last Minute Deals page is the place for you. With numerous properties offering discounts from 10% – 20% off the advertised rate, you’re sure to find a vacation rental property. Visit the page to view the most up to date rentals, or give us a call at (855) 903-1962. Emerald Isle Realty has amazing Outer Banks vacation rental deals for every season. Bookmark our Seasonal Specials page and check back often to find great seasonal rates on vacation rentals throughout North Carolina’s Crystal Coast. Enjoy your vacation knowing you’re having fun while saving money. Last but certainly not least, Emerald Isle Realty is proud to offer discounts on an extensive selection of beautiful vacation rentals to the men and women who courageously serve our country. You’re there for us, so we’ll be there for you to help you save on your next vacation or military reunion at the Southern Outer Banks. Check out the savings offered year-round on our Military Vacation Deals page. So now that you have the insider information on a budget-friendly vacation to the Crystal Coast, it’s time to plan your vacation. But don’t worry, we’re always here to help. At Emerald Isle Realty, we pride ourselves in helping people plan the perfect vacation. We’ll help you figure out what features and amenities are the most important to you to find the perfect vacation rental and extracurricular activities to make your trip to Emerald Isle totally worth it.